The European martial arts were either lost to time, or evolved into sport forms - modern fencing, boxing, and wrestling. However, through the hard work, ancient manuscripts written by skilled masters are accessible to the public. 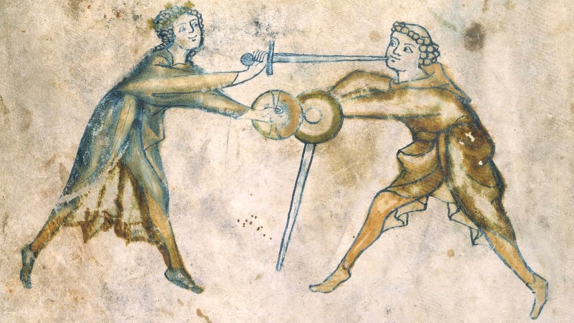 We are starting to understand the lost martial arts of Europe. What have we found? Martial arts just as nuanced, technical, and artful as any of those found in Asia. You can now learn the historical european martial arts as they were intended, in a safe, controlled environment. Become a sword fighter. This is a weapons-based martial art that you can apply to one of the fastest growing combat sports in the world. Want to know who will be teaching you? Our instructors come from varying fencing backgrounds to make sure we find what works for you. Also, they're kind of nice people. We are nice people with swords. You should come be a nice person with a sword too. One of the oldest manuscripts in the world (1320's )features a priest teaching a student progressively more advanced counters. Towards the end of the book, a woman fencer shows up, and proceeds to dismantle all of those techniques. She is an expert fencer. The sword is the great equalizer - let's find one that feels like home to you. Before class, and while we're sparring, a little music goes a long way. This playlist is collaborative, so our students and instructors can always add to it. Just no Burt Bacharach, ok?